Last Friday the Rocket track programs traveled to Garden Plain for the Wayne Pipkin Invitational. The meet is unlimited entry and had several area schools participating. Sophomore Faith Exley placed second in the 100-meter dash with a time of 13.36. Senior April Carney followed her with a time of 13.73 seconds. 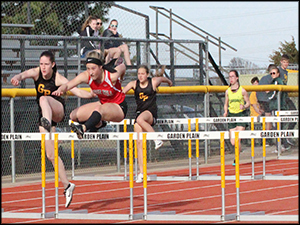 The sophomore class saw more success when Aubrie Thomison took second in the 100-meter hurdles, finishing in 17.26 seconds. The girl’s 4x1 team took second out of 7 teams. Thomison, Exley, Carney, and Thrush finished with a time of 52.91 seconds. In the boys events Luke Witt took 5th in the 100-meter dash followed by Senior Travis Jones in 11th place. Sophomore Gryphen Tambling took 3rd in the 400 with a time of 58.69 seconds. Since there were no team scores it is difficult to tell how they stacked up against the rest of the teams; however, the Rockets saw several cases of individual success from their athletes. Throughout the course of the meet the Rocket programs saw high placements on the girls and boys sides of the meet, check out the results page for a list of all of the top placers. On Tuesday, they will travel to Bell Plaine to compete in the Belle Plaine Invitational.